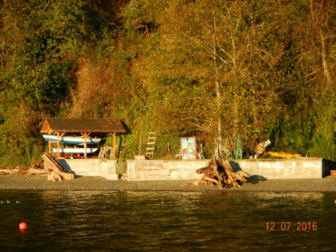 The owners of this Vashon Island property are under investigation by King County for armoring the beachfront by installing an unpermitted seawall made of rocks, logs and sandbags. The homemade seawall prevents sand from the bluff above from covering rocks along the shore and providing a place for fish to lay eggs. The vacant parcel is located on Olympic Drive in northwestern Vashon Island, on the Colvos Passage. Now a renewed focus on the area’s diminishing orca population has provided proponents with their best chance ever of a winning new powers for the state Department of Fish and Wildlife to manage the building of seawalls, docks and other structures along the state’s shorelines to interfere with natural processes. Of particular interest are seawalls, which can hold back sand that would otherwise cover rocky shores, providing small fish such as surf smelt a place to lay eggs. Currently, hundreds of miles of Puget Sound shoreline have been ecologically compromised by these and other structures, reducing populations of small fish and taking a toll on a Puget Sound food chain that ends with resident orca whales. The state House last month passed legislation that would provide the agency with more effective ways to stop people and businesses from building seawalls, docks and other structures without the proper permits. The legislation now must pass the Senate, but is currently stuck in the Agriculture, Water, Natural Resources and Parks Committee, where chairman Kevin Van De Wege, D-Sequim, is hedging on whether he will join the other three Democrats on the panel to pass the legislation at a meeting of the committee today. The legislation would allow Fish and Wildlife officers to issue civil fines, much like a traffic ticket, but with penalties of up to $10,000 in particularly serious cases. Currently the maximum fine is $100 a day for however long construction lasts. It would also empower the fish cops to issue stop-work orders, like their counterparts at the state Ecology and Natural Resources departments. And it would change the current system that basically guarantees any single-family property owner the right to put up a seawall, allowing Fish and Wildlife the ability to reject permit applications from single-family waterfront homes. The proposed law is an effort to reverse a years-long trend to armor ever-higher amounts of Puget Sound shoreline with seawalls. Scientists say this is helping to depress populations of surf smelt, sand lance and other small fish. 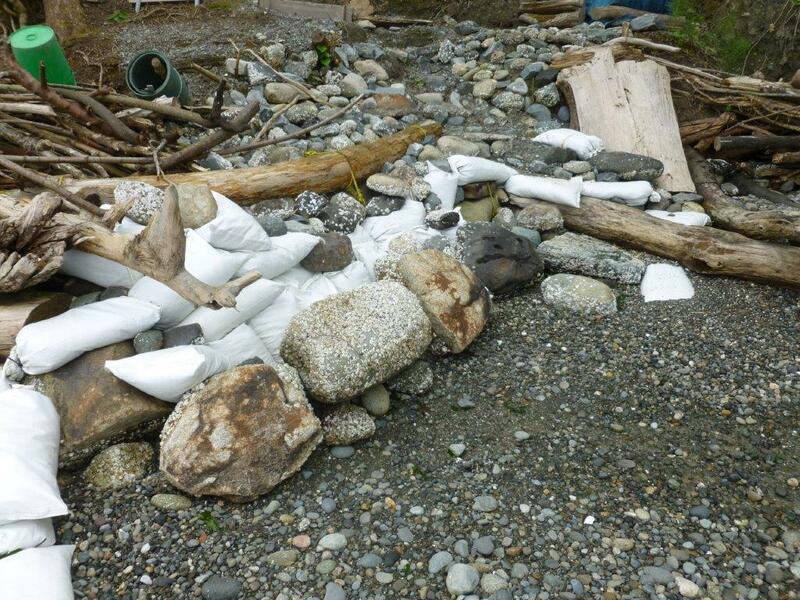 The Washington Department of Fish and Wildlife, which employs the officers responsible for enforcing the state’s hydraulic code, has repeatedly spotlighted a lack of effective tools to deal with illegal shoreline building. Currently, the officers must jawbone with offenders or — in severe cases with recalcitrant property owners — turn to local prosecutors to file misdemeanor criminal charges. Yet, this is sometimes a hard sell for prosecutors with dockets full of DUIs, domestic assaults and other crimes. In those cases that are prosecuted, the maximum fine is $100 a day for however long construction lasts, and it can be difficult to get the offending dock, seawall or other construction removed. The legislation currently being considered by lawmakers would allow Fish and Wildlife officers to issue civil fines, with maximum penalties of up to $10,000. This year, new momentum has come from Gov. Jay Inslee’s orca-recovery task force, which placed fixing illegal beach alterations as a high priority. Legislation to better empower Fish and Wildlife agents, as the task force suggested, has been proposed in the past but the recent plight of the orcas has added urgency to the cause. But builders, business interests, and even officials representing county governments argue that giving Fish and Wildlife officers more power is a bad idea. They say there is plenty of protection through county-level review of shoreline-protection plans mandated by the state. Legislation to beef up Fish and Wildlife officers’ powers has never fared this well before this year. This year’s bill, HB1579, passed the House 59-39. Van De Wege, who has long opposed giving Fish and Wildlife officers more power, said he is concerned that the agency’s actions can upend an individual property owner’s simple plans to add a dock or other project that may have already received a local government’s blessing. Fish and Wildlife’s handling of these permits “is one of the reasons people really don’t like government. … They can sink your project after doing all the other stuff,’’ Van De Wege said. Van De Wege’s Olympic Peninsula district includes many farms and many miles of shoreline. One of the major arguments for passing the legislation is to halt the continued armoring of shorelines by seawalls. That messes with natural processes and reduces habitat need by smaller fish, which are called forage fish. They are eaten by larger fish such as salmon, which in turn feed the orcas. Although some seawalls are being removed to help the fish, data kept by the Puget Sound Partnership, a state agency, shows that reductions in the amount of fortified shoreline are still being outpaced by the increase in new beach sea walls. The authority to issue stop work orders and levy larger fines is seen by tribes, environmental advocates and others as far superior to the fish cops’ current tools. King County Department of Natural Resources officials discovered this unpermitted bulkhead on Vashon Island during a survey of armored shorelines last year. The property owners, a retired teacher and his wife, responded to the agency’s inquiry by saying representatives of the agency had visited in 1996 and the couple persuaded the inspector to allow it to remain. It is unclear whether the county will insist on its removal. The agency today can seek $100 daily fines or ask a county prosecutor to file criminal misdemeanor charges. But there is little middle ground between criminal charges that are severe or fines that can be treated as the cost of doing business. “As long as we’re relying on criminal enforcement, there’s really no enforcement,” said Daryl Williams, a consultant for the Tulalip Tribes near Marysville and member of the State Conservation Commission, during recent legislative testimony on proposals to changing the Fish and Wildlife Department’s authority. The original bill’s sponsor, Democratic Rep. Joe Fitzgibbon of Burien, also included a provision to let a landowner seek a pre-permit review by Fish and Wildlife, a way to allow waterfront property owners to see if a hydraulic permit from the agency is even needed. Initially the Washington Farm Bureau opposed the bill (as well as its Senate counterpart, SB 5580). Tom Davis, director of government relations for the Farm Bureau, testified against early versions of the bill, expressing fears that Fish and Wildlife could impose crippling sanctions on farming near Eastern Washington waterways — far from the orca and salmon habitats being eyed for protection. But the pre-permit review option has helped diminish the farm group’s opposition. Davis told senators recently that his members remain concerned about who makes decisions on stop work orders and the consistency of applying rules. Brad Shannon is one of the longest-serving journalists covering the Washington Legislature. He left The Olympian in October 2018 after 30-plus years, many of which he spent covering a wide array of issues as political editor and statehouse reporter/bureau chief. He now is covering key environmental issues facing the legislature for InvestigateWest. Thanks for covering this issue, hidden from most people who are not seeing the shorelines of WA. I had no idea so many new seawalls were being built, and impacts on Orca and salmon recovery. The article is detailed and really needs a “summary: take action” section. 4. Provide incentives to take down older structures, out of compliance with current laws. 5. Support our WDFW Biologists and Enforcement officers!